Since Trump was elected to take the highest office in the country, politics and news of reforms have flooded every aspect of our lives. Even if you choose to stay out of the political jargon, you seem to get dragged into the conversation by an old high school acquaintance, relative, or friend. If you can’t escape politics, imagine how what businesses big and small are doing to stay neutral on subjects. 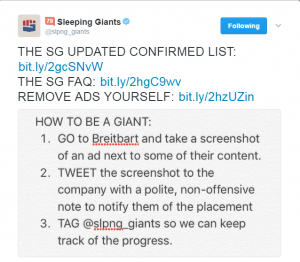 Before the election happened, we saw a rise of concern for where brands were advertising or finding their customers online, spearheaded by a Twitter account called Sleeping Giants (@slpng_giants) and its followers, brands advertisements were called out for appearing on one particular site, Breitbart.com. Breitbart is a far-right media outlet that has been credited with helping Donald Trump get elected and is also known for posting questionable content. 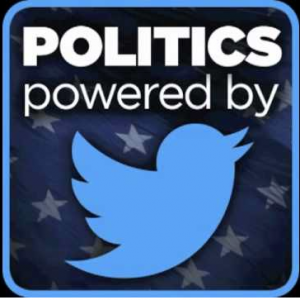 Sleeping Giant and its followers screenshot display ads that show up on Breitbart and tweeted at the brand to inform them about their ad placement. As we all know in the marketing world image is everything and who you or your brand associate yourself with can be a make or break situation. So far Sleeping Giant has gotten over 935 brands to pull their advertising from Breitbart and other similar sites. Interestingly enough Breitbart has retaliated with certain brands pulling their advertising. For example, when Kellogg announced they would not be advertising on the site anymore, Breitbart asked for a boycott of all Kellogg products from its readership; Which returned massive support for the brand and users vouching to support the Kellogg brand for standing up against the site and it’s threats. 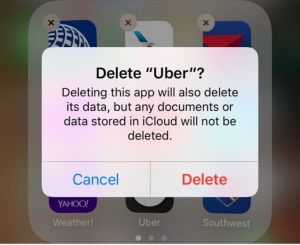 Uber is a perfect example of how a brand is perceived can make or break a brand. Uber found themselves coming under fire and losing multiple users when they unknowingly continued service in NYC, as Taxi drivers called for a strike in protest of the TravelBan that had taken place due to executive order. The brand unknowingly kept servicing users and offering rides to and from the airport during a Taxi driver strike. While Uber meant no harm or insensitivity to what was going on in our country, being unaware of the issue and continuing business in NYC has cost the ride-sharing brand thousands of users nationwide, thanks to a #UberBoycott campaign that took off on Twitter and quickly spread to other social sites. During the same time, competitor Lyft took advantage of the situation donating $1Million to the ACLU to help with legal costs. This move quickly showed where the brand stood and where its competitor stood due to their actions. While brands are slowly being made to pick a side, our Commander-in-chief has put the pen down from signing executive orders to give his Twitter fingers a little exercise. Tweeting “…Ivanka has been treated so unfairly by @Nordstrom…” after the department store decided to remove her clothing brand from their store. As we all know, a Trump tweet can move markets, causing other brands image or stock price to fall in result. GM and Toyota’s share value dropped a couple points after Trump took to his personal Twitter to call out the auto makers for having their cars assembled in Mexico. We expected to see Nordstorm face the same Trump curse, dropping a few points after the initial tweet was sent out. To everyone’s surprise, the department store giant bounced back past their previous share value and ended the day at 4% higher share cost. Coordinate internally to find out where your business or brand stands on certain issues. Review the businesses advertising plan and where you’re showing up if you’re remarketing to consumers. Be aware of issues going on where your brand does business and how your business model can effect directly or indirectly. If you have any questions about your marketing efforts during this time, don’t hesitate to reach out. We’d be happy to talk through and questions or concerns you might have.